The Registered Nurses' Association of Ontario Book Draw Contest (the "Contest") is open from 12:00:01 a.m. Eastern Time ("ET") on November 5, 2018 to 11:59:59 a.m. ET on November 20, 2018 (the "Contest Period"). By participating in the Contest, each entrant agrees to abide by and be bound by these Official Rules and all decisions of the Registered Nurses' Association of Ontario ("RNAO"or the"Sponsor"), which shall be final and binding, without right of appeal, in all matters relating to this Contest and the awarding of the prize(s), including without limitation eligibility and/or disqualification of entries. The Contest is open to legal residents of Canada (excluding Quebec) who are at least sixteen (16) years of age or older as of the date of entry, and who are either an RN/NP or in an undergraduate academic nursing program in Canada (excluding Quebec). Entrants who are below the age of majority in their jurisdiction of residence must have permission from their parent or legal guardian before entering the Contest. Excluded from eligibility are the officers, directors, employees, agents and representatives of Sponsor, any Contest judges, and each of their respective parents, subsidiaries, affiliates, advertising and promotion agencies (collectively, the "Promotion Entities"), and members of the immediate families (defined as parents, siblings, children and spouses, regardless of where they live) or households (whether or not related) of such officers, directors, employees, agents and representatives. NO PURCHASE NECESSARY. Valid email address required. To obtain one (1) automatic entry into the Contest, register as a member or as an undergraduate nursing student member of the RNAO. Then, during the Contest Period, have provided your agreement to have your membership automatically renewed for future membership years, or be eligible for and have selected the membership fee category of "currently unemployed/underemployed" or "new graduate" or "RN Emeritus" or "Lifetime Achievement". 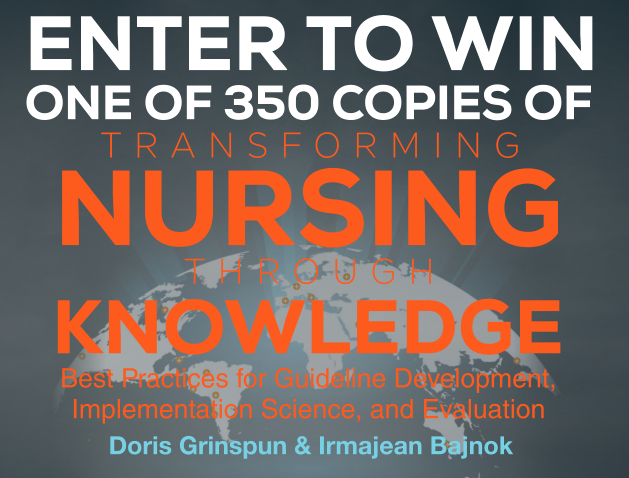 If you do not want to be automatically entered into the Contest, send an email to info@rnao.ca with “BOOK DRAW: DO NOT WISH TO PARTICIPATE” as the subject and Sponsor will remove any entries you would have otherwise been eligible to earn in this Contest. To obtain one (1) entry without making a purchase, type or clearly handwrite on a blank piece of paper an original essay describing why it is important to be a member of RNAO, to a maximum of 250 words, and together with your first name, last name, phone number, age, province and email address, the date of the Contest Period, and indicate whether you are an RN, NP or a nursing student, and mail the above information to: RNAO, 158 Pearl Street, Toronto, Ontario, M5H 1L3. LIMIT one (1) mail entry per outer stamped envelope. All mail entries must be received by the end of the Contest Period. Mail entries that are mechanically reproduced or made in any fashion other than as specified herein are void. Limit: one (1) entry per person and per email address during the Contest Period. 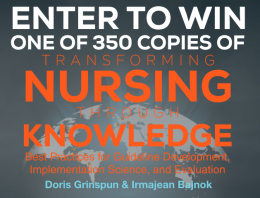 There are three hundred and fifty (350) prizes available to be won, three hundred (300) for RN/NP members and fifty (50) for undergraduate nursing students, each consisting of one (1) book (approximate retail value $90.75 each). Prize must be accepted as awarded and may not be substituted, transferred or redeemed for cash or otherwise, except at Sponsor’s sole discretion. Sponsor reserves the right, at its sole discretion, to substitute a prize of greater or equivalent monetary value if a prize cannot be awarded as described for any reason. Prize includes delivery to verified winners only to one (1) address in Canada. Additional delivery attempts will be subject to a $20 shipping and handling fee. Sponsor will not replace any lost or stolen prizes. Any other costs or expenses associated with the prizes not specified herein will be the responsibility of selected winners. On or about 1:00 p.m. ET on the day of the Contest Period, a random draw will be conducted from among all eligible entries received during (or for) that Contest Period for the purpose of selecting three hundred (300) potential RN/NP member winners and fifty (50) potential undergraduate nursing student members (subject to satisfying the prize claim conditions below). Odds of being selected depend on the number of eligible entries received during (or for) the Contest Period in applicable category of membership. Selected entrant(s) will be notified by email at the email address provided in connection with their membership, or for mail-in entries in the mail-in entry. In order to be declared a winner, selected entrant(s) must: (i) respond to notification of selection within five (5) business days of first attempt by Sponsor; (ii) correctly answer a time-limited mathematical skill-testing question to be administered online as instructed by Sponsor; (iii) if requested, sign and return to Sponsor a written declaration and release form, releasing the Promotion Entities from any liability in connection with this Contest or the use, misuse, awarding or possession of any prize (the “Release”); and, (iv) otherwise comply with these Official Rules. In the event that a potential winner is below the age of majority in his or her jurisdiction of residence, Sponsor may require the potential winner’s parent or legal guardian to ratify any required Release. Return of any prize or winner notification as undeliverable, inability to reach selected entrant or failure of selected entrant to respond to notification within five (5) business days of first attempt by Sponsor or Sponsor’s agent, failure to provide proof of eligibility (if requested), Release, or other required documentation in a timely manner, failure to correctly answer the skill-testing question, or other non-compliance with these Official Rules may result in disqualification, forfeiture of the prize and, at Sponsor’s sole discretion, selection of an alternate eligible entrant for the forfeited prize in accordance with these Official Rules, who will be subject to disqualification in the same manner. Sponsor reserves the right to terminate, suspend or modify this Contest, in whole or in part, at any time and without notice or obligation if, in Sponsor's sole discretion, any factor interferes with its proper conduct as contemplated by these Official Rules. Without limiting the generality of the foregoing, if the Contest, or any part thereof, is not capable of running as planned for any reason, including but not limited to infection by computer virus, bugs, tampering, unauthorized intervention, fraud, programming errors, or technical failures, which, in the sole discretion of Sponsor, corrupt or affect the administration, security, fairness, integrity or proper conduct of this Contest, Sponsor may, in its sole discretion and void any suspect entries and: (a) terminate the Contest, or any portion thereof; (b) modify or suspend the Contest, or any portion thereof, to address the impairment and then resume the Contest, or relevant portion, in a manner that best conforms to the spirit of these Official Rules; and/or (c) award the prizes from among the eligible, non-suspect entries received up to the time of the impairment in accordance with the winner selection criteria discussed above. Sponsor reserves the right at its sole discretion to disqualify any individual who tampers or attempts to tamper with the entry process, the operation of the Contest, violates the Official Rules, or acts with intent to annoy, abuse, threaten or harass any other person. BY PARTICIPATING IN THIS CONTEST, ENTRANTS AGREE THAT SPONSOR, CONTEST JUDGES AND THE PROMOTION ENTITIES HAVE NO LIABILITY WHATSOEVER FOR, AND SHALL BE HELD HARMLESS BY ENTRANTS AGAINST, ANY LIABILITY FOR ANY INJURIES, LOSSES OR DAMAGES OF ANY KIND (INCLUDING DIRECT, INDIRECT, INCIDENTAL, CONSEQUENTIAL OR PUNITIVE DAMAGES) TO PERSONS OR PROPERTY RESULTING FROM THE CONTEST, INCLUDING THE ACCEPTANCE, POSSESSION, MISUSE OR USE OF THE PRIZE, OR THE MERCHANDISE FOR WHICH IT IS REDEEMED (IF APPLICABLE). FURTHER, BY PARTICIPATING IN THIS CONTEST, ENTRANTS AGREE THAT SPONSOR, CONTEST JUDGES AND PROMOTION ENTITIES HAVE NO LIABILITY WHATSOEVER FOR, AND SHALL BE HELD HARMLESS BY ENTRANTS AGAINST, ANY LIABILITY FOR ANY INJURIES, LOSSES OR DAMAGES OF ANY KIND (INCLUDING DIRECT, INDIRECT, INCIDENTAL, CONSEQUENTIAL OR PUNITIVE DAMAGES) TO PERSONS OR PROPERTY RESULTING FROM: A) ENTRY OR PARTICIPATION IN THIS CONTEST, OR B) ANY CLAIMS BASED ON PERSONALITY OR PRIVACY RIGHTS, DEFAMATION OR MERCHANDISE DELIVERY. Some jurisdictions do not allow the exclusion or limitation of incidental or consequential damages, therefore such exclusions may not apply to you. Without limiting the foregoing, Sponsor, Contest judges and the Promotion Entities, and any of Sponsor's other suppliers or contractors, shall not be responsible for: (a) any incomplete or inaccurate information that is caused by any website or by any of the equipment or programming associated with or utilized in the Contest, or by any technical or human error which may occur in the processing of submissions in the Contest; (b) lost, interrupted, or unavailable network, server, service provider, on-line systems, telephone networks or telephone lines, or any other connections; (c) the theft, destruction, loss or unauthorized access to, or alteration of, entries; (d) any problems with, or malfunctions or failures of, telephone networks or lines, computers or computer on-line systems, servers or providers, computer equipment, software, viruses or bugs; (e) garbled transmissions or miscommunications; (f) failure of any e-mail to be received by or from the Contest judges or Sponsor for any reason, including but not limited to traffic congestion on the Internet or at any website or combination thereof or technical incompatibility; (g) damage to a user's computer equipment (software or hardware) occasioned by participation or downloading of materials related to this Contest; (h) printing, distribution, programming or production errors, and any other errors or malfunctions of any kind, whether human, mechanical, electronic or otherwise; or (i) technical, pictorial, typographical or editorial errors or omissions contained herein. Sponsor and its authorized agents will collect, use, and disclose the personal information you provide when you enter the Contest for the purposes of administering the Contest and prize fulfillment. All entries become the property of Sponsor and will not be returned and no correspondence will be made with or entered into except with selected entrant(s). By participating in the Contest, each entrant agrees that Sponsor, Contest judges and the Promotion Entities have not made, with respect to each of their own products/services provided as a prize or part thereof (if applicable), any warranty, representation or guarantee express or implied, in fact or in law, with respect to the prize and specifically disclaim all such warranties, including without limitation, the implied warranties of merchantability and fitness for a particular purpose. Winning a prize is contingent on fulfilling all the requirements set forth herein. Mass entries, automated entries, entries submitted by third parties, and any entries or prize claims that are late, incomplete, fraudulent, illegible, unidentified or delayed will be void. All entries and prize claims are subject to verification. Proof of entry submission does not constitute proof of receipt. Entrants agree to abide by these Official Rules. Decisions of Sponsor and/or any independent Contest judging organization will be final and binding on all matters pertaining to this Contest. Contest is subject to all applicable federal, provincial and municipal laws. Void where prohibited. Sponsor reserves the right to correct any typographical, printing, computer programming or operator errors. Sponsor's failure to enforce any term of these Official Rules shall not constitute a waiver of that provision. The invalidity or unenforceability of any provision of these Official Rules shall not affect the validity or enforceability of any other provision. If any provision of the Official Rules is determined to be invalid or otherwise unenforceable, then the Official Rules shall be construed in accordance with their terms as if the invalid or unenforceable provision was not contained therein. The Sponsor reserves the right, in its sole and absolute discretion, to administer an alternate test of skill as it deems appropriate or necessary to comply with applicable law. Should a winner make any false statement(s) in any document referenced above, the winner may be required to promptly return to Sponsor his/her prize, or the cash value thereof. WARNING: ANY ATTEMPT BY AN ENTRANT OR ANY OTHER INDIVIDUAL TO DELIBERATELY DAMAGE ANY WEBSITE ASSOCIATED WITH THIS CONTEST OR UNDERMINE THE LEGITIMATE OPERATION OF THE CONTEST IS A VIOLATION OF CRIMINAL AND CIVIL LAWS, AND SPONSOR RESERVES THE RIGHT TO PROSECUTE AND SEEK DAMAGES TO THE FULLEST EXTENT PERMITTED BY LAW. In the event of a dispute as to the identity of the person who submitted any entry, the authorized account holder of the e-mail address submitted at registration or in a mail-in entry will be deemed to be the entrant. The "authorized account holder" is the natural person assigned an e-mail address by an access provider, service provider, or other person or organization responsible for assigning e-mail addresses for the account associated with the submitted address. The potential winner may be required to show proof of being the authorized account holder.